Our 14 oz Thermal Travel Tumbler features a dual-wall design and measures 3.75"w x 5.5”h. 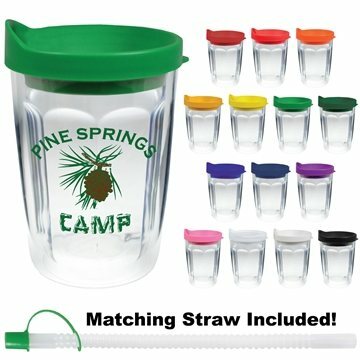 Each travel tumbler comes with a snap-on slider lid for warm drinks and a straw with a matching tether cap for cold drinks at no additional charge - choose from 14 stock lid and cap colors.Have questions about what the best decoration option is for you? Call us or email your artwork and we will help you figure out which decoration option is best for your promotion and budget. Would recommend AnyPromo to everyone that is looking for quick and reliable service. Loved it! Very satisfied with the quality and durability of this item. the price was good and the customer service Veronica gave was great. Incredibly happy with AnyPromo. Our logo looks great and our clients love them! It was just what I expected with.